China’s debts worry the world, so a recent rush towards more equity-raising by Chinese companies sounds like a good thing. If investors were more discerning, it would be. When shares run up as rapidly as they have in Shanghai, Shenzhen and lately Hong Kong, skimming off the froth is the rational thing to do. China Eastern Airlines is one company that has spied an opportunity. It said on April 23 it would raise $2.4 billion by placing shares at a 25 percent discount to its last closing price in Shanghai. The shares promptly rose – widening the gap to 39 percent by midday on April 27. Investors’ pleasure at seeing companies raise growth funding evidently outweighs their worries about being diluted. Others are dipping in too. Underwriting volumes for equity in mainland China increased 37 percent in March, according to Credit Suisse. Financial services companies loom large in the pipeline, including insurers Taikang and Sunshine, which are planning Hong Kong listings according to Chinese media. Regulators are also becoming more relaxed. The China Securities Regulatory Commission, which shut down initial public offerings altogether when markets looked weak, approved 25 listings last week, and has pledged to wave through two batches a month from now on. More equity and less debt is just what China needs. Its non-financial companies had borrowed 125 percent of GDP by mid-2014, according to McKinsey. The equivalent figure for U.S. companies is 67 percent. Because of heavy-handed regulators and volatile markets, equity funding has provided just 3 percent of all corporate finance over the past 10 years, far behind loans, bonds and trade-related IOUs. In March the figure was a more encouraging 6 percent. Issuers are wise to use the window while it remains open. China’s equity markets are pumped up less by fundamental factors than by the paucity of alternative investments, particularly as the property market sags. IPOs are a particular magnet for equity mania. Laobaixing Pharmacy is 74 percent above its prior-week float price in Shanghai; Shenzhen Ellassay Fashion is 92 percent up on its recent debut. Investors will be the ones left with losses if exuberant valuations fall. But at least smart companies will have more healthy balance sheets to show for it. 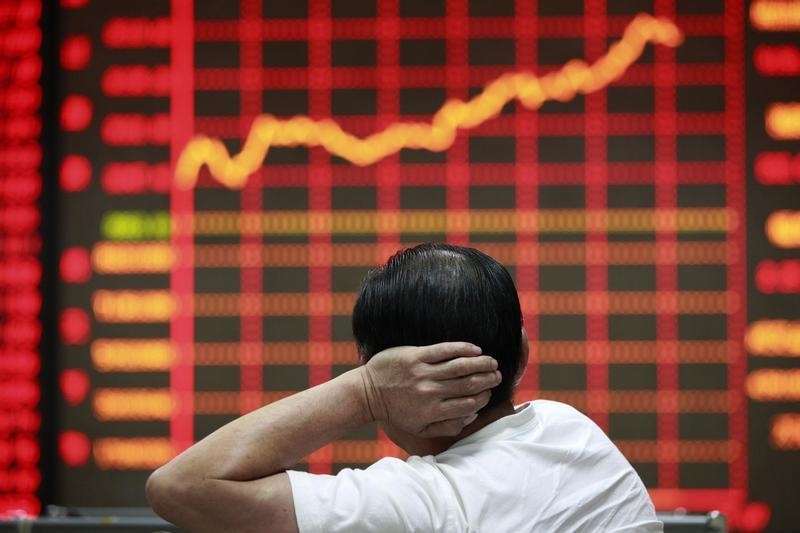 An investor looks at an electronic board showing stock information at a brokerage house in Huaibei, China. Equity underwriting volumes in mainland China were up 37 percent in March compared with the same time a year earlier, with 24 issues, according to Credit Suisse. China Eastern Airlines said on April 23 it would issue around 15 billion yuan ($2.4 billion) in new shares in Shanghai to fund expansion of its fleet. The price would be at least 6.44 yuan a share, a 25 percent discount to where the shares closed on April 24, the first trading day after the announcement, and a 30 percent premium to the closing price of the company’s Hong Kong-listed shares. Several Chinese financial services companies are planning to issue new equity. Among them are insurer Zhong An, which is seeking first-round financing, while insurers Taikang and Sunshine have been reported by local media to be considering Hong Kong initial public offerings. Shanghai-listed stocks traded at a 30 percent premium to their Hong Kong-listed counterparts on April 27, according to the Hang Seng A-H Premium Index. The prices were close to parity at the beginning of December last year. China’s securities regulator approved 25 IPOs on April 23, and said that it would increase its approvals to two batches per month instead of one. The Shanghai Composite index fell slightly the day after the approvals, but opened up on April 27, trading at 4499 points, up 39 percent so far this year.